The Part Time Gourmet: Is Kobe Beef Worth the Price? Is Kobe Beef Worth the Price? 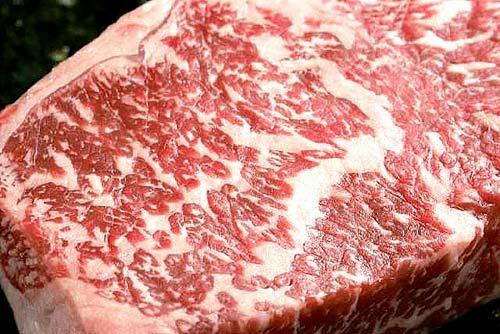 Chefs and diners are paying a fortune for Kobe beef, the marvelously marbled Japanese-style delicacy. But is it worth the price? The first thing you notice about wagyu is the marbling, the thin veins of fat running through the muscle. There is so much marbling in a good cut that it makes even Prime meat look lean. In this case, appearances are not deceiving; while Prime beef carcasses average about 8% fat, some wagyu goes 20% and even more. The fat has a different consistency too. It is higher than other beef in mono-unsaturated fatty acids, so it is softer at room temperature and it has a "clean" taste — it doesn't coat your mouth the way most beef fat does. That chuck steak from Mitsuwa, normally a tough cut that should be braised, was so well-marbled that it grilled up with the slightly chewy texture and deep flavor of a good New York strip. But it's not just the fat: Even a lean tri-tip from Vicente Market had a buttery texture and an amazing depth of flavor — good wagyu tastes like the concentrated essence of beef. Obviously this meat is not intended to be an everyday thing, but as a very occasional splurge for real beef lovers, it is definitely worth the high price. It is as different from run of the mill beef as a great Burgundy is from Two-Buck Chuck. And because the flavor is so rich, a little bit of it goes a long way.